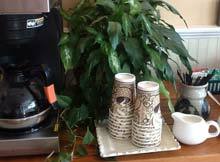 A home-baked, continental breakfast is served daily from 7:30 a.m. until 10:00 a.m. from May 1st to October 31st. 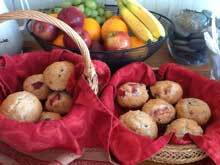 Breakfast includes freshly baked muffins ranging from traditional wild Maine blueberry to strawberry rhubarb, apple pie muffins, double chocolate chip, banana chocolate chip, raspberry, blackberry, peach mango and more. These home-baked delights are also served with yogurt, fresh fruit, juice and coffee.